We've previously written about the benefits of juicing in this blog, but not all juicing is the same! Vegetable and fruit juices can be made using a number of different process and each have their pros and cons. We touched on the differences between juicing and blending in previous posts, but in this article we will go into much more detail. We'll also describe some of the types of equipment that we use in our Juice Bars and the differences between them. The fundamental difference being that juicing extracts the liquid nutrients, which includes the vitamins and minerals, but leaves behind a pulp containing insoluble fibre that the body can't easily digest. Everything that goes into a blender will end up in your drink - which is usually called a smoothie. This is because it includes the blended pulp and is naturally a lot thicker than a juice. Blending also allows the easier introduction of other ingredients, such as superfood supplements. We regularly use things like cacao powder, matcha green tea or whey protein in our smoothie recipes. The supplements are blended with the fruit and vegetables to provide a homogenous smooth drink. Fibre is essential for digestive health, although the body cannot digest it. The fibre acts like a broom and helps to clean out the intestines and keep everything “moving”. Juices contain no fibre, but is that a bad thing? Not at all, in fact juicing main benefits. Since we cannot break down and digest fibre, we excrete it. This means we also excrete some of the nutrients in the produce consumed because they are bound up in the fibre. Juicing breaks down the plant cells and extracts the nutrients from the fibre, so they are readily available for the body to absorb. This makes juices both easy to digest and quick to absorb. It is therefore possible to pack in more nutrients into a single juice drink. Juicing makes it possible to consume a much higher volume of fruits and vegetables than you would be able to consume eating them whole. If you were to sit down and eat 2 heads of kale, that would be a lot of food. You wouldn’t enjoy chewing through it and you would probably get a stomach ache from the volume and fibre. However, you can run two heads of kale through your juicer with an apple or two and a lemon and have an extremely easy to consume and much more delicious way to consume all of the vitamins, minerals, enzymes and phytochemicals contained within the produce. As noted above, fibre is beneficial for digestive health. Whilst too much fibre can hinder nutrient absorption and also be difficult to digest, fibre is an essential part of a balanced diet. Fibre promotes elimination of waste and healthy gut bacteria. Smoothies contain the whole fruit/vegetable, so they include all of the plant’s fibre, but the blender makes them easier to consume by breaking them down for you. Blending provides more options for what can be included in the finished product. Juicing is primarily done with fruits and vegetables only because those yield liquid. Smoothies may include lots of other super nutritious, non-liquid yielding items like cacao, coconut oil, dates, protein powders, avocados, bananas and more. It’s much easier to make a full substantial meal with a healthy balance protein, fats, and carbs out of smoothie than a juice for that reason. A word of caution though: be careful about the amount of sugar that you are taking on if you overload with too much fruit. It is not unusual to have a juice containing four whole apples. That is a lot of sugar which needs to be taken into account when consuming fruit juices alongside other sugar rich foods. Let's start with blenders, because this is the easy one! Blenders are characterised by having a jug with a single opening where everything goes in. There's a sharp spinning blade at the bottom which pulverises the contents. All blenders are basically the same, the differences will be in the size, quality of parts and speed of the blade. I faster spinning blade will generally produce a better quality smoother texture in the same time. One of the disadvantages of blenders is that they can be very noisy - as anyone who has stood at the counter of one of our Juice Bars on a busy day can testify! Also beware of many ‘ juice machines’ on the market which are actually blenders e.g. Nutribullet. 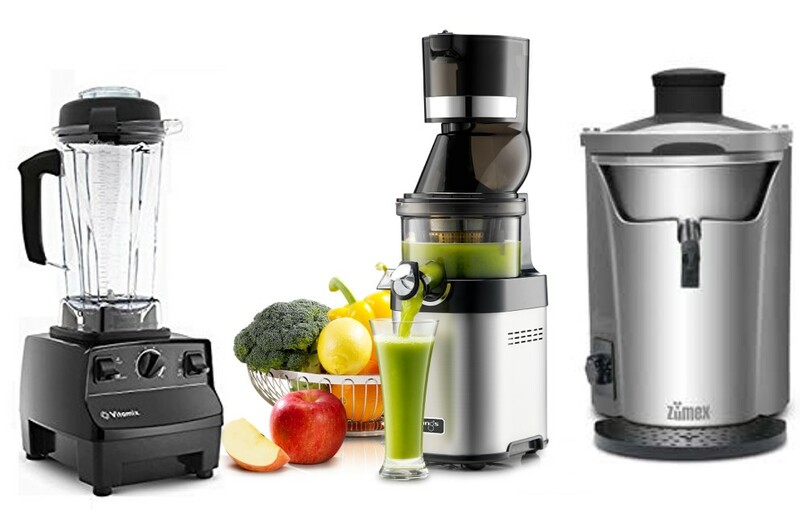 At Barannes we use the popular Vitamix blenders which are designed for commercial use. They are hard wearing, rugged and efficient, but also quite expensive. This is the most common type of juicer which uses a fast-spinning metal blade that spins against a mesh filter, separating juice from flesh via centrifugal force. The juice and pulp are then separated into different containers. The pure juice is collected in a jug at the front and the waste pulp is collected in a bin to the rear. We didn’t like the idea of all our juice pulp going to waste so we are now supplying a local pig farmer who uses it as a supplement for his pigs. Apparently they like everything except orange waste! The one disadvantage with centrifugal juicers is that the fast-spinning metal blade generates heat, which accelerates the natural oxidation process of the enzymes in the fruits and vegetables. This is why fresh juices are best consumed within two hours of juicing, or at worst within 24 hours. These newer juicers extract juice by first crushing and then pressing fruit and vegetables for the highest juice yield. Because they don’t produce nearly as much heat, they keep more of the fresh ingredients’ nutrients intact. However, they can be very slow and can't be used to produce fresh juices while you wait. We’ve recently invested in 2 brand new Kuvings juicers. These are commercially graded and designed for use in professional juice bars. The slow moving motors are designed for 24hr use and are claimed to produce up to 40 litres of juice per hour. At Barannes we use a combination of centrifugal and masticating juicers. Our standard range of juices are made while you wait so we use a fast and efficient centrifugal juicer. We also supply a range of ‘grab and go’ bottled cold pressed juicers which are made using the cold press process. These juicers take longer to prepare but will keep for up to 3 days. This makes them ideal for selling ready made from the refrigerated cabinet. You will see these at Coopers Cafe at Castle Quay and The Lovin’ Spoonful at Snow Hill. Watch this space for more outlets and if you have a cafe and would like to sell Barannes Juices contact us for details and a trade price list. For our specialist drinks such as wheatgrass shots and for our range of juice based detox products we use a combination of single and twin gear masticating juicers. Which is best? Juicing or blending? The truth is both and neither! Hopefully from the explanations above you can see that both techniques have different benefits. For a balanced approach to juicing our recommendation is that you need both. If you haven't got the time to juice and blend or you can't afford the additional equipment then worry not - this is why Barannes is here. We provide a convenient way to get your daily does of healthy juices and smoothies. Unlike some other juice bars, you see everything that goes into your juice and all our recipes are focused on taste and health.